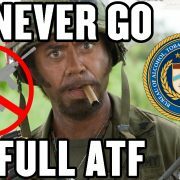 Well the time has come and the ATF has ruled on Bump Stock devices and they are now saying they are now considered machine guns. If you have missed this staggering news, check it out here. I have taken a look at the entire 157 page document and will break down critical parts. Lets go […] Read More … The post Never Go Full ATF – Analysis Of Bump Stock Ban appeared first on The Firearm Blog.